If you have been looking for ways to optimize your website content, you must have come across this phrase so many times. Publishing high-quality content on your website is extremely crucial, especially when you’re struggling to secure a place in the top position of SERP. Everyone from Neil Patel to Brian Dean is explaining the benefits of high-quality content and the need to optimize content before publishing. Even Google has mentioned publishing high-quality content while designing a Google-friendly website. The truth is if your website has high-quality, user engaging, and well-optimized content, you do not even need to rely on paid promotions to rank higher at all. However, the real question is how one should optimize the website content so that it can grab the user’s attention while meeting Google’s guidelines at the same time? Many website owners struggle to find the most suitable answer to this question and so often end up utilizing unethical content optimization strategies, which cause more harm than good. So, in this blog, we have decided to shine some light on content optimization techniques and list down the ways by which you can craft quality content for your website. What Does Content Optimization Mean? Before moving any further, let’s first take a look at what does content optimization actually mean? Basically, there are a couple of SEO practices which you can utilize to make your website content search engine friendly as well as appealing for the audience. While optimizing content, you need to focus on both the target audience as well as the search engine guidelines. Your content should be informative and provide value to the audience. Furthermore, it should also be easier for the crawlers to crawl your website for certain user queries. This can be achieved by following certain rules. So, without any further ado, let’s start with the content optimization guidelines. How to Optimize Website Content? It is worth noting that there are different categories of content that you can publish on your website. The most common content categories are text, images, and videos. Some of the websites even have infographics as well. So, it is important to familiarize yourself with the right optimization strategies for optimizing each type of content. The page title is the first thing a user notices about your website. It gives a hint to both the customers and the search engine about what your web page is all about. So, it is important to craft the most appealing page title which has the potential to captivate your target audience. Follow the following guidelines to write the best page titles. Keep the title length within 50-70 characters. Try to write an informative title which gives the customer a hint about what to expect from the web page. Precisely add keywords to your title. However, make sure to avoid keyword stuffing as it can damage your search engine rankings drastically. Add words like Best, Top, and Ultimate. You can also shape your title like a question to make it more appealing. Many people use words like How, What, Why, etc. in their titles to enhance their conversion rates. Write page title which set your website apart from your competitors. Don’t be a copy cat and try to write unique titles. Of course, these are only a couple of guidelines, which can make more page title a little better. We recommend using your creativity to come up with a highly appealing page title. Let’s take at some of the examples to understand how you can get creative with the page titles. As you can see that Neil has written an appealing title which compels the user to click on the link. He has also mentioned his brand name (i.e. Neil Patel) in the title itself. You can do it too, however, make sure to mention the brand name in the last of the description. Writing the brand name, in the beginning, can damage the search engine rankings, and therefore it should be avoided. As of best SEO practices, it is advised to add your target keyword at the beginning. Brian, in the above case, has used the word “updated” to make his page title more appealing. A user after stumbling upon this search result on SERP is more likely to click it. So, make sure to utilize your creativity while writing the page title for your web pages. Once the customer has read your page title, the meta description would be the second thing going to alure him. So, it’s important to write a captivating meta description which meets the search engine guidelines. As of good SEO practices, your meta description should be between 150-170 characters. You would want to keep the description as descriptive as possible while precisely sprinkling your target keyword somewhere in between. If you do not upload the meta description or your description fails to meet the recommended guidelines, Google’s going to automatically pick a description from the web page, which you do not want at all. Always make sure to manually upload a unique description for each web page. Here are a couple of tips to write the perfect meta descriptions. Keep the description length in between 150-170 characters. Google automatically shortens long description which may not tell the customer about the web page. Do not stuff the descriptions with keywords. Google is smart enough to differentiate between a natural and keyword stuffed description. So, make sure to naturally place the keywords. Each website on your website should have a unique meta description. Copied descriptions can lead to content duplication. Let’s take a look at some of the good meta descriptions. In the above snippet, as you can see that, Neil has kept the description as simple as possible. However, he has made sure that the description is highly informative so that it tells the customers what the web page is all about. Now, comes the actual website content. Of course, your website should be stacked with quality and informative content. But, it’s also important to optimize the content by formatting it in the right way. By formatting, we mean adding suitable heading tags, writing short paragraphs, adding internal links, etc. You can’t expect a user to read a 2000 words blog post if it doesn’t have the right format. It becomes difficult for both the user and the search engine to understand the content. So, make sure to optimize the content so that it is easier for everyone to understand it. 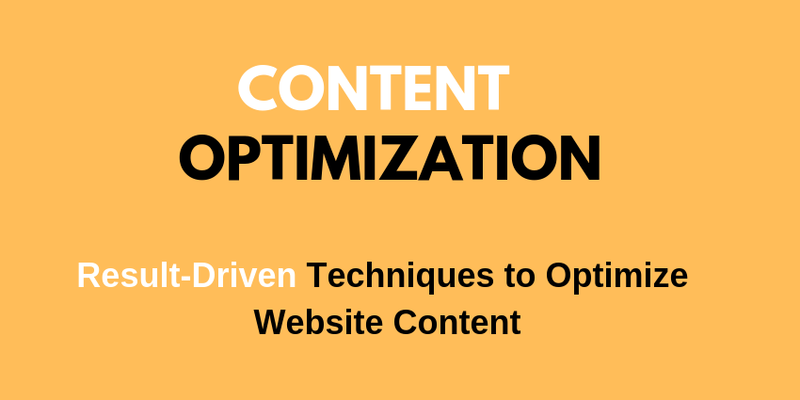 Here’s how you can optimize the website content. Add individual H1 tags to each web page. H1 tag contains the heading of the webpage and each web page can have only one H1 tag. Insert the subheadings in dedicated H2 and H3 tags. Basically, you should maintain a hierarchal order while adding headings and subheadings to your web pages. Lengthy paragraphs damage the content readability. Try to write concise and informative paragraphs. It is always recommended to add bullet points in your posts as they make your website more appealings. If you’re publishing blogs, always make sure to insert the target keyword within the first 100 words. Furthermore, every blog posts should have a conclusion as well. Images are an integral part of every website, especially when you want to attract organic traffic. Publishing images improve the content readability and make your web pages more appealing. However, if the images on your website aren’t optimized, your search engine rankings can fall drastically. Search engines cannot read images. So, they use other signals to understand what a particular image is all about. The two of the major image optimization factors include image title and image alt text. Each image should have a meaningful title. For instance, if you’re uploading a cat picture, it is better to name it as “White-Cat.jpg” rather than naming it like “IMG001.jpg”. While you can add the target keyword to the image title, unnecessary keyword insertion is a bad SEO practice. Alt text is the text which screen-readers use to read an image. It is also displayed in the place of an image if it fails to load by any chance. So, it is important to add a descriptive alt text to every image. You can insert your target keyword in the alt text. While uploading images on your website, make sure to compress the image size. Large image files can increase the website loading speed, which eventually damages the overall website performance. Therefore, it is important to reduce the image file size so that they do not affect the loading speed at all. Like images, videos can be a great way to attract your potential audience. However, it is important to optimize the videos as well. When it comes it videos, you can’t reduce the file size or add alt text to them. The one thing that you can do, though, is to keep the videos short and informative. For instance, if you’re uploading a video to demonstrate a tutorial to install a specific product, you should keep the video length as short as possible. Long videos do not only slow your website, but they also tend to get boring sometimes. Not everyone has the time and patience to watch a one-hour long video. So, try to upload short videos only. The best practice is to use a streaming platform like Youtube to publish videos on your website. Once you have published the video on Youtube, you can easily embed them in your source code. This won’t damage your website speed. However, while publishing videos on Youtube, make sure to add appealing titles, informative descriptions, and target keywords. Apart from the above-mentioned guidelines, there are a couple of additional guidelines which you should keep in mind while publishing content on your website. Some of these guidelines include. If you think you can trick Google by publishing duplicate content, you’re wrong. Google is smart enough to understand which content is original and which one is simply copied from somewhere else on the internet. So, trciking Google is not the case at all. The truth is duplicate content damages your website in many ways. Copied content lowers website authority and can lose you a lot of your potential customers. It can even cause Google to penalize your website, which you would not want at any cost. So, make sure to publish original, informative, and high-quality content on your website. As we have mentioned earlier, keyword stuffing is a bad SEO practice and posses a huge threat to your website. There was a time when you could have expected to rank higher simply by stuffing your blogs with the target keywords. However, as per the current scenario, keyword stuffing is nothing but an unethical SEO practice. Maintain a natural flow throughout the web page and insert keywords when necessary.